Another Sunday, another snippet. Click HERE to find all the other participating authors! As always, thank you to everyone who stops by my blog to say hi and leave comments! 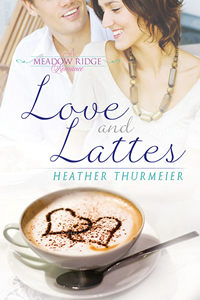 For the next couple of weeks I’m offering up snippets of my debut release LOVE AND LATTES, A Meadow Ridge Romance available for pre-order from Silver Publishing now, and everywhere else on Sept. 10! Click HERE if you want more info! This snippet happens right after Julia and Chase meet again for the first time since having one spontaneous night together. She’s not too thrilled with the discovery of who Chase really is…her new boss. Of course he’s my boss. That’s just my kind of luck. Julia knew her cheeks must be bright red, but there was nothing she could do to calm the embarrassment burning inside her. I slept with my boss. She shook her head, trying to comprehend how in the world this could have happened. Of all the places she could have gotten a job, of all the guys she could have fallen into bed with on one spontaneous night, she had picked this store and this man. Uh oh!! Sounds great. more please! Nice Heather. Can’t wait for it to be released! Very nice 6, want to read more! Excellent! I can’t wait for this to be released!! I grinned through the entire snippet. You made me want to know how hot the night was and how they go on from here. Ruh-roh! Great set up. One or both of them is in BIG trouble! Love the voice in this! Great title, too!!! Charming cover and your voice is delightful, Heather. Fun six. Sounds like a great read. Can’t wait to buy it! Fantastic six! you have a beautiful style that is oozing through every sentence. Well done. Uh oh, sounds like morning after regret to me. oops. Loved it. Great six. Ooooh! It’s gonna get tense. Love it! Great six! Aside from walking into work on your first day with your dress tucked in your knickers, I can’t imagine anything more embarrassing! Sounds like a great story and I’ve marked my calendar. Congrats hon! Oh I can’t wait to see what happens! LOL I feel bad for her. I can’t wait for this book to come out! OMG! It’s bad enough to start a new job, but face a hottie you intended to forget and wow, he’s your boss??? I gotta read this one. Great six, congrats on the Sept. 10 release. Congratulations on your upcoming release! This was fabulous. Her emotions are just bleeding through the words. Fantastic!! I can’t wait to read more!! Oh dear. Compounded first day jitters! Great six, Heather. Congrats on your new release! OMG. Gives new meaning to the word ‘awkward’! I love her internal dialogue. 🙂 Looking forward to the release! Oops! There might be a career change in her future — or not! Lovely snippet. Heather, Nice sentences. Can’t wait for the Kindle edition to be available. Uh oh. Ain’t that always the way? 😉 Lovely cover, by the way. Oopsies!! I foresee troubles ahead!! Isn’t that always the way! ?